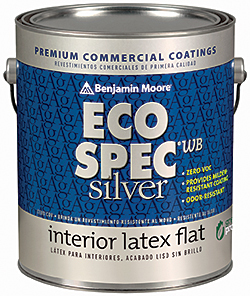 Eco Spec WB Silver is the first zero-VOC paint in the U.S. formulated with elemental silver and other EPA-approved antimicrobial additives that inhibit bacterial odors and mildew growth on the paint surface. It remains zero-VOC even after tinting and no matter the color. Recommended for high-humidity locations and high-traffic commercial facilities. Available in three finishes: flat, eggshell and semi-gloss.